Gold futures ended lower on Monday for the fifth time in six sessions as gains in the U.S. dollar pressure safe-havens. Gold for April delivery declined $14.30, or 1.1%, to settle at $1,245.10 an ounce on the Comex division of the New York Mercantile Exchange. The settlement was the lowest since March 2. Gold prices ranged from a low of $1,238.40 to a high of $1,261.90. "The dollar is showing a lot of strength, and obviously that’s gold bearish," Bloomberg News quoted Tim Evans, the chief market strategist at Long Leaf Trading Group Inc. in Chicago. "The economic view of the overall market has improved. And that’s what ultimately what led corrective price action that we had in the market." Gold futures shed 0.9% last week, falling from the 13-month high on Thursday. Silver for May delivery slipped 8.4 cents, or 0.5%, to settle at $15.521 an ounce. Silver prices traded between $15.41 and $15.85. They dropped 0.6% last week. 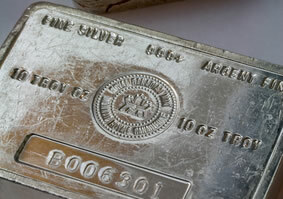 April platinum fell $4.30, or 0.4%, to $965.40 an ounce, ranging from $955.90 to $978. Palladium for June delivery lost $7.15, or 1.2%, to $572.80 an ounce, trading between $565 and $578.25. Last week, platinum declined 1.7% and palladium gained 3%. Gold declined $22, or 1.7%, to $1,242.75 an ounce. Silver added 10 cents, or 0.7%, to $15.60 an ounce. Last week, London bullion prices were mixed with gold down 1% and the others rising by 0.5% for silver, 1.5% for platinum and 4.7% for palladium. United States Mint bullion products posted gains of 3,000 ounces in gold coins and 709,000 ounces in American Silver Eagles. The U.S. Mint this week again limited sales of Silver Eagles to 1 million. Distributors ordered 70.9% of them on Monday, leaving 291,000 left until more become available next week. Their cumulative total for the year is 12,709,000 coins, or 27.3% higher than through the same time in record year 2015. On this day March 14, 1900 the U.S. Congress passed the Gold Standard Act. That didn’t last long till FDR stopped it in 1933. Good idea in theory, not in practice! The U.S. Mint announced in December that due to a new law passed by Congress & signed by Obama December 4, the 2016 ASE collector version coins will not be ready for sale till some time in the summer because they are required to have special 30th anniversary edge lettering that takes awhile to make the collars & do test striking. Have patience & just buy the bullion version if you can’t wait!